John McCombs tells a joke during his standup set. The comedian is the co-producer of Wild Comedy Club’s new monthly comedy series held at the Celtic Knot Public House. John McCombs broke into the Chicago comedy scene alongside Hannibal Buress, or more accurately, waiting behind him for his turn to perform at a Milwaukee Avenue bar. 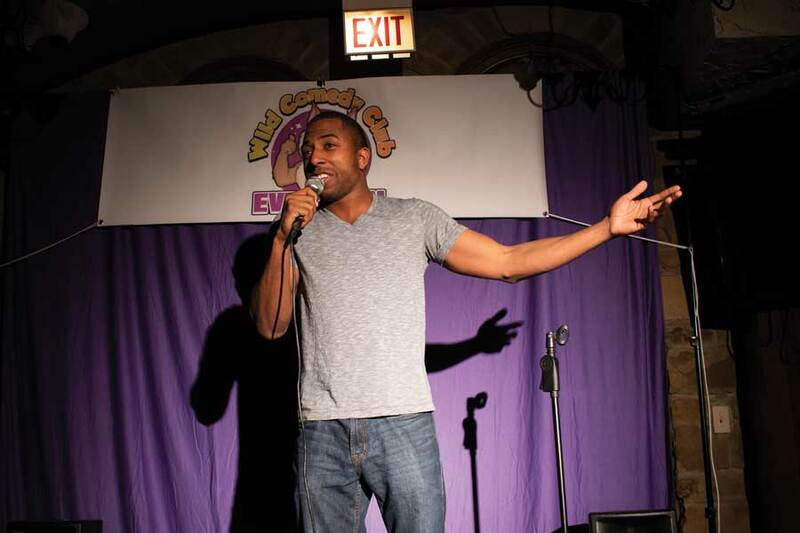 Since then, McCombs has continued to frequent the city’s comedy clubs and is now filling the stand-up void in Evanston. McCombs is currently co-producing Wild Comedy Club’s new monthly comedy series hosted inside the Celtic Knot Public House, a free show set for the first Sunday of every month. Chicago-area comedians took the stage on Oct. 7 at 8 p.m. for the group’s premiere performance in a back room of the Evanston bar. McCombs turned the stonework cubby into a homey theater by organizing rows of chairs and decorating the stage with a banner and mic. The show featured a lineup of five comics including The Titanic Players, a Northwestern improv group, McCombs said. Each comedian prepared a set under ten minutes to share with the Evanston audience. Having produced Chicago stand-up in the past, McCombs said he was familiar with the gig. However, he said he noticed a lack of comedy in the suburbs and wanted to bring some of Chicago’s talent up the lakeshore—an opportunity he found in Evanston. In addition to the absence of a large comedy scene, McCombs said Evanston was the perfect location for Wild’s monthly shows because of its lively nature as a college town. Although currently a producer for the show, McCombs is no stranger to live comedy. He said he has experienced the Chicago comedy scene as both a performer and producer — an eye opening opportunity. As a producer, McCombs does more than schedule comics — he engages with them and the stories they have to offer. He said he finds parties with non-comedians dull compared to get-togethers of comedians that are filled with carefully crafted and well-delivered stories. While co-producer and Evanston native Paul Miller echoed this sentiment, he did clarify it takes more to be a comic than witty conversation. Although telling jokes to friends may be easy for some, Miller said true comedy is a nerve-wracking and time-consuming form of entertainment. Even though the room tucked away in the back of the Celtic Knot is small, it can be filled with standing audience members eager for an intimate comedy experience. While intimidating, Miller said these small spaces allow a comic to connect with people more. Comedian Adrienne Brandyburg, who performed at Wild’s first show on Sunday, said this connection and joy from audiences is why comics continue to put in the work to perfect their craft. While timing can fail and jokes can fall flat, the art form becomes an obsession.